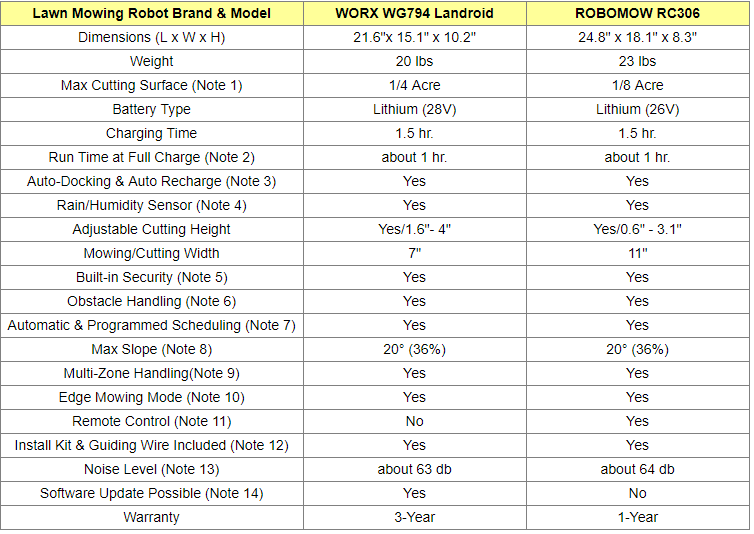 Compare Top Lawn Mowing Robots: WORX Landroid WG794 vs. ROBOMOW RC306? If you own or rent a property that has a nice front yard and/or backyard covered with grass, it's quite important that you take care of it to keep it beautifully trimmed at all time. But some yards are larger than others, and it may be quite a long and tedious job to do the mowing all by yourself. You could of course hire someone to do it, but that can get costly in the long run. Nowadays, there is a better solution: getting a lawn mowing robot to do it for you. Robotic lawn mowers are powered by a battery and come with a charging station, also known as the base station, where they automatically go to recharge themselves as soon as their battery gets low. The base station is usually connected to a wall socket via an included AC/DC power transformer. ​These robots determine and set automatically the mowing schedules based on the lawn size and characteristics you specify, but you can also modify and adjust these default schedules as required. ​At the scheduled mowing times, the robot leaves the base station, mows the lawn, drives back to the base station to be recharged, and proceeds mowing until the job is complete. After completion, the robot will stay in the base station until the next scheduled mowing cycle. ​Note that in order for the robot to be properly guided while mowing your yard, you will need to lay a guiding wire around the perimeter of the entire lawn and around protected areas within the lawn area. Once the wire is laid down, the beginning and end of the guiding wire are connected to the base station. When the robot departs for mowing, the base station automatically triggers a special signal, which is transmitted through the wire. This creates a virtual wall visible only to robot and that keeps the robot within the lawn boundaries, and prevents it from entering areas it was intended to skip or protect. Usually, small pegs are used to fasten the guiding perimeter wire into the ground, below grass level. Note that the wire will gradually disappear under the growth of new grass until it will become invisible. Note also that some people prefer to secure the guiding wire into the ground to avoid accidental cutting of the wire by the robot. 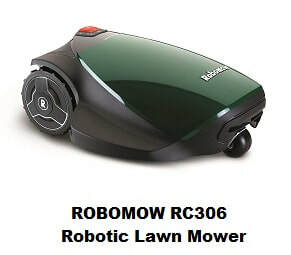 This article will compare robotic lawn mower WORX WG794 and ROBOMOW RC306. These were not just the most popular among Amazon customers at the time this article was written, but they had also received excellent reviews from most Amazon buyers (average ratings of at least 4 stars out of 5 stars!). Species of grass in your lawn and its growth rate. Sharpness of the cutting blades. Number of obstacles in your lawn. If you need a robotic lawn mower for a surface largen than 1/4 Acre, please see the end of this article for recommendations. The run times at full charge provided above are approximate as they depend on the same factors provided in Note 1 above. When they sense that the battery is getting low, both robots go back to the base station for recharging. Once recharging is complete, they proceed with completing the scheduled job. This feature allows the robot to stop mowing and return to the base station when rain is sensed. Both robots are equipped with a PIN-enabled lock to prevent unauthorized use and an anti-theft alarm. To prevent injuries, both robots automatically shutdown when they sense that they are lifted or tilted. 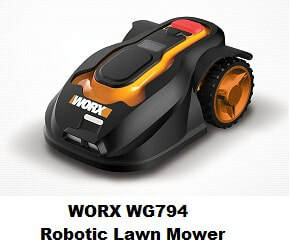 WORX WG794 is equipped with obstacle sensors (the robot uses shock sensor system to mow around obstacles). With ROBOMOW RC306, when the bumper senses an obstacle, the blades stop and the robot changes its driving direction. With WORX WG794, once you have completed your installation and lawn setup as described in your user manual, the robot will automatically determine the amount of work required to mow your lawn and will set up accordingly a mowing schedule for the whole week. So, when you activate the robot, it will start mowing according to that schedule without any additional programming requirement on your part. However, you can modify and adjust the default schedules computed by the robot: you can set which days to mow, what time to start, and how long to mow. - You first need to execute a one-time setup (described in detail in the user manual) to define the area of your lawn. - Based on this set-up, the robot will automatically determine the Mowing Cycle which is the required number of mowing hours for your lawn. - The default mowing frequency is MEDIUM which is equivalent to two Mowing Cycles a week. This means that the robot will complete the entire mowing of your lawn twice a week. However, the default mowing frequency can be modified if desired to LOW (one Mowing Cycle a week) or HIGH (one Mowing Cycle per day). - You can set times when the mower will be inactive during specific days of the week and during specific hours for all days of the week. The robot simply stays in the base station during the inactive times. ​The default for inactive day is Sunday, and the default for inactive hours is 23:00-06:00. These defaults can be modified to whatever day(s) or hours you may want. Both robots can mow areas with slopes of up to 20 degrees as long as these areas are within the space outlined by the guiding wire. Multi zones are handled by laying the guiding wire in such a way that the robot only goes to those zones you want mowed. If two different zones are connected by a narrow passage such as a pathway or a strip of grass, you will need to pass the wire through the narrow passage and leave any fence that may exist between the two zones open. Both robots provide you with a special edge mode that allows the robot to mow along the boundary wire to the edge (the included boundary/guiding wire is used to outline the intended mowing area exactly). WORX WG794 can not be remotely controlled at this time. - get a quick summary of mower's state, the mowing progress and the next planned operation. - obtain instant assistance, online diagnostics and technical fixes conveniently and remotely. - mow those small patches located away from your main lawn and navigate from one garden to the other. - send to mow, return to base, disable automatic depart and program your mowing schedule. The guiding wire is laid around the perimeter of the entire lawn to be mowed and around protected areas within the lawn area, in order for the robot to be properly guided while mowing your yard, and around the protected areas within the lawn area. Both robots are quiet enough to be operated at night or early morning. ROBOMOW RC306 currently can only be updated in the company's workshop by a serial port. So which of the two robotic lawn mowers to buy? Both lawn mowing robots considered here are excellent products as shown by the average rating each had received from Amazon customers at the time this article was written. Indeed, both had received 4 stars (out of 5 stars). They both have a Lithium battery, rain sensors and built-in security as described above. They both allow adjusting the cutting height, can handle slopes (up to 20°), return automatically to recharge when battery gets low, and they both can be scheduled. There is a good chance that you would be quite happy with either of these products. If you have more than 1/8 Acre of yard to mow, then you should consider WORX WG794 which can mow surfaces up to 1/4 Acre. However, ROBOMOW does make robots that can mow surfaces larger than 1/8 Acre (please see the end of this article for some additional ROBOMOW robots suitable for areas larger than 1/8 Acre). Though both robots can schedule automatically mowing times and periods based on the size and characteristics of the lawn specified during set-up, any programmed scheduling that may be required to modify the default scheduling data is done quite differently on these two robots. Please see Note 7 above for a brief explanation of the differences. WORX WG794 is equipped with a USB port and can be remotely upgraded when new features or bug corrections are available. ROBOMOW RC306 does not currently have this feature. ROBOMOW RC306 supports Wi-Fi and can be remotely controlled. You can even use your smartphone as a joystick! At this time, WORX WG794 does not support Wi-Fi and can not be controlled remotely. WORX provides its customers with a 3-Year limited warranty while ROBOMOW gives 1-Year warranty. Please click the robotic lawn mower of your choice below for price information or to purchase. Note: ROBOMOW also makes lawn mowing robots for different sized surfaces as shown below. Please click the images for additional info on these robots.